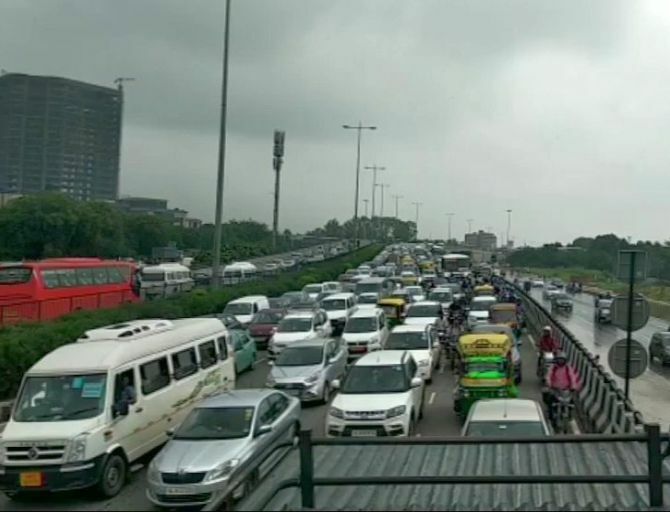 Rush hour traffic was thrown out of gear in Haryana's Gurgaon as morning commuters got stuck in traffic snarls, including an over five-kilometer jam on a road between Hero Honda Chowk and Khirki Daula Toll Plaza. 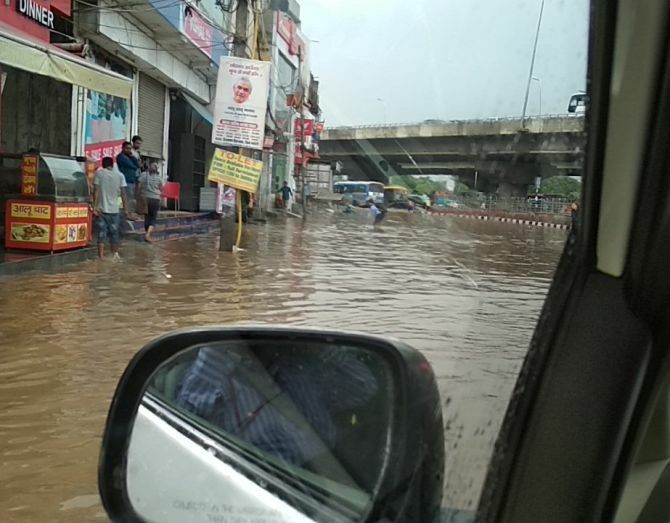 Several residents took to Twitter to share their experiences and posted photos of waterlogging and jams. Office-goers in Delhi, too, faced a lot of inconvenience due to traffic disruptions with most opting to use the Delhi Metro rail's services, which were delayed due to over-crowding. Classes in several colleges in Delhi were also cancelled. The meteorological department has forecast more rains through the day and relative humidity at 100 per cent in Delhi. The Palam observatory recorded 101 mm rainfall, Lodi 22.2 mm, Safdarjung 49.6 mm and Ridge 6.8 mm, the department said. 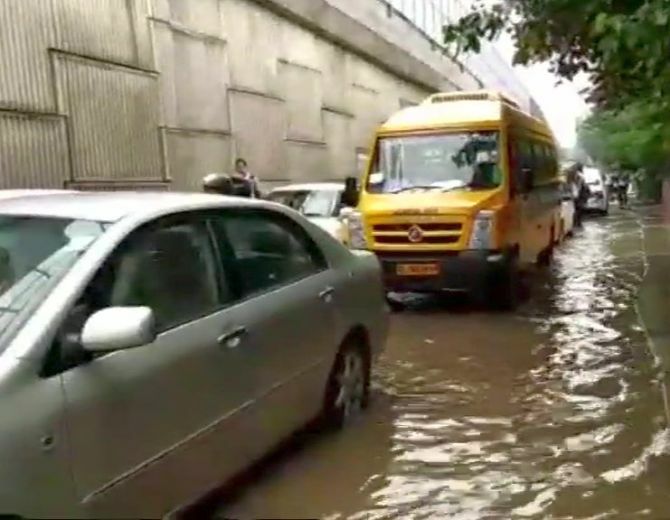 Heavy rains were recorded in central and eastern parts of Delhi with water-logging and traffic congestion being reported from areas such as Mayur Vihar, Palam, Duala Kuan, Bhairon Enclave in Punjabi Bagh, Moti Nagar flyover and between Mundka and Rajdhani Park. Traffic was affected near Narela Mandi due to an uprooted tree. 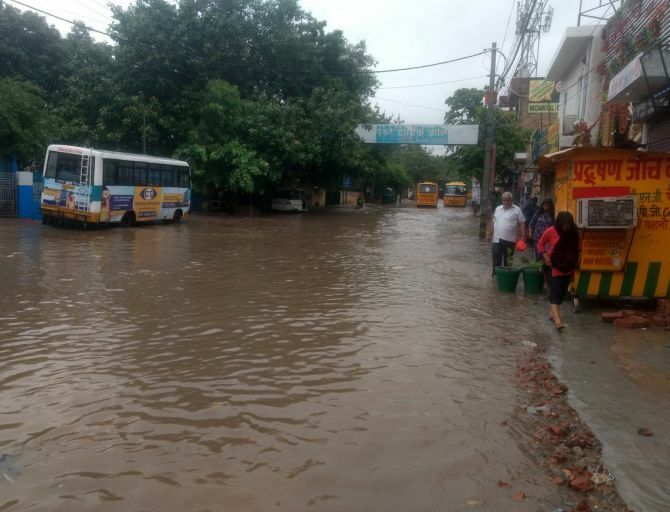 Waterlogging was also reported from Devli, Vayusenabad, Sangam Vihar, at GTK towards Mahendra Park, Inderlok Chowk towards Zakhira near underpass, Rao Tula Ram Marg, on Rama Road and at the roundabout between Windsor place and Dr Rajendra Prasad Road. "I waited for 45 minutes for the metro. This is not right. At least during peak hours the frequency should be improved," Sunita Kumar, a Delhi University student travelling by the metro's Blue Line said. 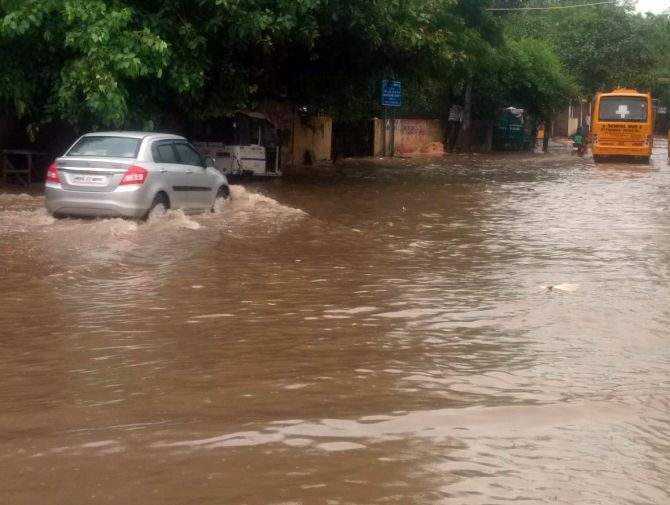 On Twitter, some Gurugram residents blamed Haryana Chief Minister Manohar Lal Khatttar for failing to maintain the city's basic infrastructure. "@mlkhattar mantra of Gurgaon to Gurugram name change didn't work. The state of affairs in the Cyber city remains the same," a resident tweeted. "Due to the situation, I was trapped for at least three hours in a jam and had to go back home. My son skipped school and I office today," Raman Malhotra, a resident of DLF said. "The main reason for the traffic congestion (between Hero Honda Chowk and Khirki Daula) was due to some vehicles breaking down," a Gurugram police officer said. The maximum temperature in Delhi is expected to reach 31 degrees Celsius while the minimum temperature would be 26 degrees Celsius, the Met department said. On Monday, the maximum temperature was recorded at 32.7 degrees Celsius, one notch above the season's average, and the minimum temperature settled at 27.3 degrees Celsius, one notch above the average.